Bet Jets -2.5 over Colts with Karamba. Bet Jets-Colts under 45 with 888Sport. Bet Jets-Colts under 4.5 total touchdowns with 888Sport. The Jets enter Sunday fresh off an offensive explosion against the Denver Broncos. It took a quarter, but the Jets showed their big-play capabilities with three TDs of more than 30 yards -- two of more than 70 -- in their 34-16. The eruption helped the Jets snap a three-game losing streak. In all three loses the Jets were held under 20 points. The team showed its vertical capacity in the passing game, with rookie Sam Darnold connecting with Robby Anderson for two touchdowns in the second quarter — one for 76 yards, the other for 35. Their biggest concerns, however, are injuries in the secondary and duplicating their aerial success against a Colts team that ranks 28th against the pass. 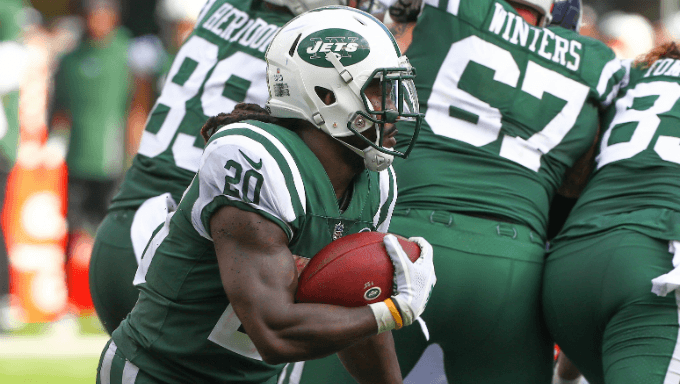 The Jets’ passing attack was enabled by an ground game led by Isaiah Crowell, who ran for 219 yards on just 15 carries, including a 77-yard TD. The Jets also welcome back cornerback Rashad Robinson from a suspension. The Colts had extra time to think about their loss last Thursday night in Foxboro. Tom Brady’s historic night — he threw his 500th career TD — helped the Pats build an early lead that forced the Colts into becoming a one-dimensional throwing team. The Colts already have one of the NFL’s worst defenses, allowing 6.5 points per game more than the Jets allow. Look for Andrew Luck to continue to compensate for his team’s deficiencies. Indianapolis basically needs him to win shootouts at this point. But that’ll be a tall order given injuries at receiver and tight end. Compounding the problem, the Colts are one of the league’s worst rushing teams, limping to a 74.4 yards per game average. To win, the Colts have to put pressure on Darnold, force some turnovers and protect the football. The Jets are down two of their top three corners in Buster Skrine and Trumaine Johnson. Skrine hasn’t been ruled out, but he’s dealing with his fourth concussion and it’s unlikely he’ll be able to play. Johnson is out with a quad injury. The team gets Rashard Robinson back but will rely on some younger talent to fill the voids. Rookie Parry Nickerson should get some time in the secondary, which could open things up for Luck if given the time. The Jets are healthy on offense, evidenced by their onslaught last week. Injuries will play an even bigger role this week for the Colts, who have lost three straight. The offense will be significantly limited with the absence of Pro Bowl wideout T.Y. Hilton, Luck’s favorite target. Luck will also be without TE Jack Doyle, an important blocker as well as pass catcher. Those are two options who could’ve helped Luck take advantage of a banged-up Jets secondary. As for the Colts defense, they’ll be without their starting strong safety. Indy signed veteran Mike Mitchell earlier this week to overcome the loss of Clayton Geathers (neck/concussion). To make matters worse, they might be down Geathers’ backup in Matthias Farley (hamstring), who is questionable. Karamba has the Jets as a 2.5-point favorite. The high-scoring home win last week for the Jets should be an accurate indicator of Darnold’s potential and for what the Jets can do even without asking Darnold to carry them on his back. This will be the case again Sunday. Hard to think the Jets won’t be able to apply a balanced attack, moving the ball on the ground (135 per game) and with timely passes. If Anderson can draw coverage on the outside, the Jets can take advantage of the middle of the field, which should be much easier to throw against because of the Colts’ injuries. Bet the Jets to cover and give the -2.5 with Karamba. The line is 45 at 888Sport, and there’s little doubt a Jets offense that’s been able to consistently run and found its scoring touch against Denver will have opportunities for points. But injuries leave the Colts with so few playmakers, which is why the under looks good here. The Jets have two games this year scoring over 30 points, and both times Darnold has limited mistakes. The Colts average a full point per game less (23.6 PPG) than the Jets average vs. (24.6) and have yet to truly break out. Outside of a 37-34 OT loss at home to Houston, the Colts have struggled to hit their average. The Colts should be playing from behind early, which will force them to throw more and invite the Jets to tee off with their pass rush. Back under 45 with 888Sport. The Jets have the offensive advantage, neither one of these teams are prolific. The Colts are struggling to justify this season at 1-4 and the Jets haven’t established an identity yet outside of last week’s breakout against Denver. The Jets are good enough to beat the Colts and good enough to win by more than 3 points. They are not, however, good enough yet to expect offensive explosions on a weekly basis. Even in their season opener, when they dropped 48 points on the Lions, it wasn’t an explosion so much as a controlled and balanced effort. Bet under 4.5 total touchdowns at +112 with 888Sport.